A Syrian provincial governor has said a preliminary agreement has been reached with armed groups in control of a valley with Damascus’ water source, which would provide for conditions to restore vital water supplies to over 5 million civilians. An initial deal has been reached with militant leaders, according to which the rebels agreed to leave the Wadi Barada area just outside Damascus, Syrian Arab News Agency (SANA) cited Damascus Countryside Governor Ala'a Ibrhaim as saying in his statement to the agency. Some of the fighters who are not originally from the Damascus area, but are now in control of the valley about 20 kilometers (12 miles) from the city, and a water spring within it, have agreed to put down their heavy weaponry and head to Idlib province, the governor said. This would allow Syrian army units to enter the area to clear it of landmines and other explosives, SANA reported, saying that the work needs to be done for repair and maintenance teams to be able to come to the area and safely fix water pumps and pipelines. Red Cross teams are also at the ready to access the Wadi Barada area "to make an assessment and provide all necessary repairs and maintenance to the damaged water lines," spokesperson for the International Committee of the Red Cross (ICRC) in Syria, Ingy Sedky, told RT. Speaking from Damascus, the Red Cross official said that while its staff were ready to help, "the most important thing is [that] the fighting stops… for our teams to be able to access the area and make all necessary repairs." "It is the responsibility of the parties fighting on the ground to make sure that all the vital infrastructure, be it in Damascus or elsewhere in Syria, should be protected," Sedky said, adding that the Red Cross can only assist in repair operations and "respond to emergency needs of the local population." Meanwhile, citing a local media office for activists in rebel-held Wadi Barada, Reuters reported no agreement to fix the damaged spring facility has been brokered between rebels and the government. There has been no immediate confirmation or denial from the fighters, the news agency said. 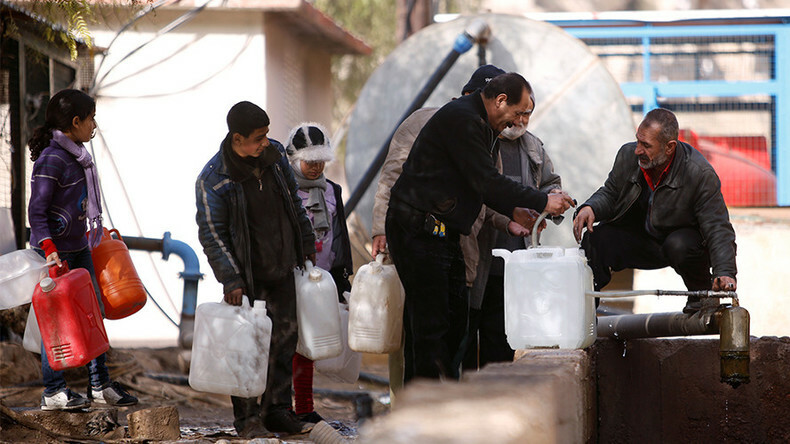 "Everyone in every sector of Damascus is suffering because of this [water] shortage. From our side, we have been assisting the Damascus [authorities] to increase water supply within the city, by providing additional water pumps, as well as water trucks and tanks," ICRC's Sedky said. 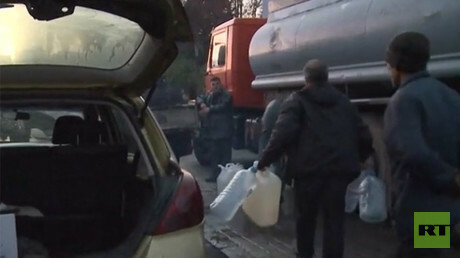 The humanitarian organization's spokeswoman also said that people in the Syrian capital could be seen gathering in the streets in large crowds to get provision of water from the trucks, which is "something we haven't witnessed for months." She added, "the situation is really dire when it comes to access to safe drinking water." "People in Damascus are suffering from huge water shortage for almost three weeks now, the whole city is basically relying on alternative sources for water, because the two main water supply lines have been damaged due to the ongoing fighting in the areas near Damascus," she said in an interview with RT. Earlier this week, RT's Lizzie Phelan reported from Damascus that shops which once stocked clean water had been left without so much as a single bottle, with civilians forced to go far from their homes to obtain water from a particular point in the city. Around 700,000 people in the capital have not had water for more than 18 days, UNICEF told RT referring to its sources, adding that it was "extremely concerned that an estimated 5.5 million people in Damascus and its surrounding areas are cut off from running water for over two weeks." 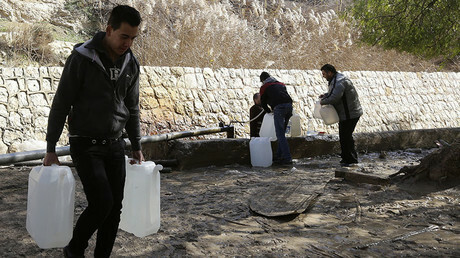 One of the main water supplies to the city, coming from Wadi Barada, was cut in late December by Damascus authorities, who said the crucial reservoir had been contaminated by militants with diesel fuel. The rebels had been rejecting all demands to leave the area, for the water source to be fixed, officials said. Fighters claimed it was the government attacks that damaged the spring.